Lothians players are on top form heading into this weekend’s 50th South East District Open at Musselburgh, with Kieran Cantley having joined Euan McIntosh and Stuart McLaren in the Scottish Order of Merit winners’ circle in August. Turnhouse star McIntosh sparked the successful spell for Capital players by winning the Leven Gold Medal before McLaren of Bruntsfield Links claimed the North East District Open at Newmachar. Now Liberton 19-year-old Cantley has got in on the act as well, by securing the North District Open at Royal Dornoch, where he prevailed at the sixth extra hole in a play-off. “I feel my game has been close all year and it is nice to have secured my first big win, which is a big confidence boost,” he said. 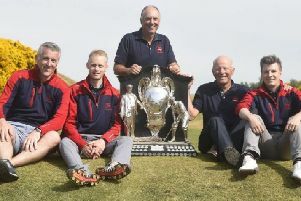 After carding rounds of 69-68-70-70 for a three-under-par total at the renowned Sutherland venue, Cantley found himself in a play-off with Cruden Bay’s Stephen Roger and Kyle Godsman of Moray. Godsman dropped out after an initial two-hole shoot-out before Cantley finally shook off Roger, a former Scottish Youths’ champion, by holing a 25-foot birdie putt. “For my breakthrough win to have come at a place like Royal Dornoch, which is reckoned [by Golf Digest] to be the fifth best course in the world, definitely makes it more special,” he added. Cantley, who is coached by former Scottish Amateur champion Colin Brooks, was part of a group of youngsters who claimed some notable successes for Liberton as they came through the ranks together. As he tries to get his game to a level where he feels he is ready to have a crack at the paid ranks Cantley is working part-time with GolfClubs4Cash in Loanhead.